Stocks seem to be taking a gap year. 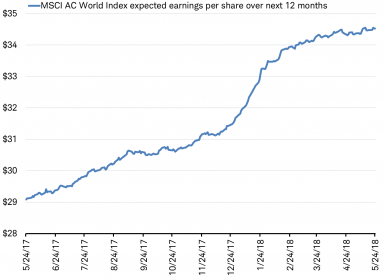 While 2017’s big effort generated a 22 per cent gain, stocks, both locally and globally, have moved little from where they started in 2018, as measured by the MSCI World Index. Are stocks taking a year off as the economic cycle matures before taking the next step? The causes of this gap year include concerns over growth, agreements, and policy. Global growth momentum may have peaked in January. The widely watched global composite Purchasing Managers Index (PMI) of business activity has been sliding since January. Economic growth measured by GDP slowed during the first quarter in many countries. And, crucially for investors, analysts’ earnings per share estimates for the next 12 months flattened out after the sharp rise in January as US corporate tax cuts were enacted, as you can see in the chart below. Source: Charles Schwab, Factset data as of 5/24/2018. 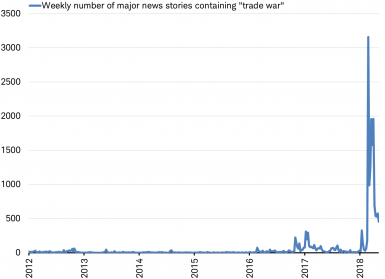 Trade agreements have been a major topic in global media this year as demonstrated with a leap in the use of the phrase “trade war” in news articles, as you can see in the chart below. Concerns over material changes to trade agreements, or abandoning them in favour of new tariffs, is likely to have contributed to the pause in stocks this year. Although this year’s trade disagreements have fallen well short of a trade war, with more than half of the sales of global companies in the MSCI World Index tied to international trade even a small risk of an actual trade war must be monitored. Source: Charles Schwab, Bloomberg data as of 5/24/2018. Stocks may have also paused in response to the ending of US monetary policy stimulus. 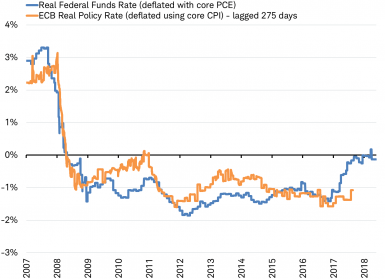 While the Federal Reserve has been tightening for some time, only this year has the policy rate moved above inflation, ending monetary policy stimulus and turning the focus to tightening as the real fed funds rate crosses zero. This can be seen in the chart below of the real federal funds rate, which is the federal funds rate less the pace of inflation tracked by the Fed’s favourite measure, the core personal consumption expenditures (PCE) deflator. Currently the pace of core PCE is 1.88 per cent. In June, we saw the Fed raise the fed funds rate to 2 per cent. In Europe, we anticipate that QE will end in the second half of 2018. The European Central Bank (ECB) may continue to follow the path of the Fed on real policy rates (with the typical lag of about 275 days seen over the past 10 years), as you can see in the chart above. 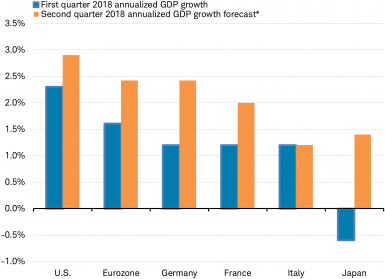 • Global growth measured by GDP is expected to reaccelerate in the second quarter for many major countries by the consensus of economists tracked by Bloomberg, as you can see in the chart below. 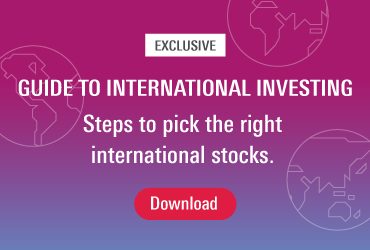 This may help to sustain the rise in earnings per share for global companies. Source: Charles Schwab, Bloomberg data as of 5/18/2018. 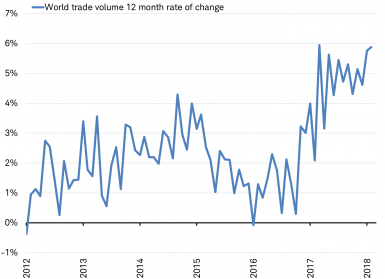 •The risk to trade agreements is balanced by the reality that world trade growth has sustained the fastest pace in years, as you can see in the chart below. • Monetary policy is beginning to tighten in the US, but fiscal policy stimulus (tax cuts) is helping offset the economic impact. More broadly, global financial conditions remain favourable to growth, as you can see in the chart below. Other concerns have emerged to keep stock markets volatile such as Italy’s many attempts to form government, an issue which took three months of negotiations to resolve. But if the major concerns that caused this gap continue to fade as they have since this year’s low in March, stocks may not end up taking a year off from gains after all. Jeffrey Kleintop is senior vice president and chief global investment strategist with Charles Schwab. Jefferey Kleintop is senior vice president, chief global investment strategist, Charles Schwab.